Mango Milkshake is one of the most popular milkshake flavours, especially during the hot summer months when mangoes are in season. Thick, creamy and delicious, this is a great way to enjoy the hot summer days. 1. Peel and dice the mangoes. Discard the seed. 2. Combine the mangoes, sugar, cardamom powder and milk, reserving 1 cup of milk. 4. Add the remaining milk and blend for another minute. 5. Pour into a serving glass filled with 2 to 3 ice cubes. Tip: You can also serve it with a scoop of Ice Cream. If you are adding ice cream, omit the ice cubes. 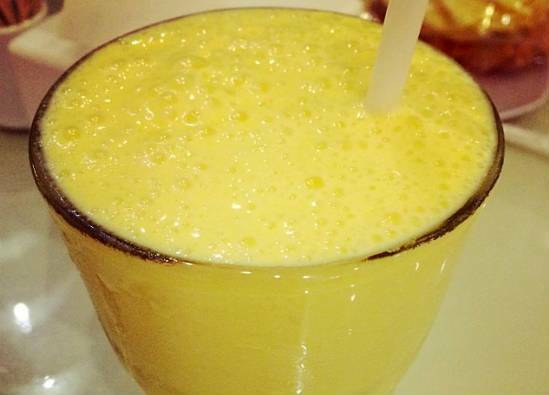 Feel free to comment or share your thoughts on this Mango Milkshake Recipe from Awesome Cuisine.